In mature ice cream marketplaces, competition for consumer loyalty is fierce. 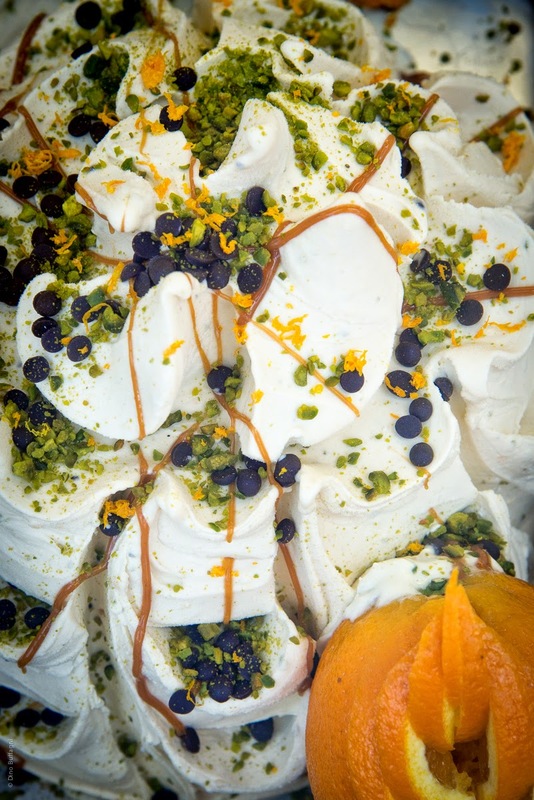 For example, in the U.S., nine out of 10 households already purchase frozen desserts, according to Packaged Facts’ Ice Cream and Frozen Desserts in the U.S.: Opportunities in Retail and Foodservice, 8th Edition. This presents manufacturers and foodservice operators the challenge of winning share within the existing consumer base rather than bringing additional consumers to the market. Further, whether a company is a global marketer or a local startup, side-by-side inside a retail freezer case they are on an equal footing for the shopper’s attention. What’s a marketer to do? New brands and flavors, especially ones that connect with consumers on an emotional level by localizing, telling a story or using specialty ingredients, coupled with eye-catching graphics is definitely a growing trend. The new Packaged Facts report examines changes that have taken place over the past two years in the competitive environment while also providing a basic review of market dynamics. It examines market size and drivers, new product introductions, the competitive efforts of key players in both the retail and foodservice sectors, advertising and promotional activities, the use of social media and consumer trends. For more information on this report, link HERE. Years ago I authored this report for Packaged Facts. Today, I share my market research analysis with you via the Daily Dose of Dairy blog. Here are some great examples of companies connecting with consumers through product formulation and packaging. Marketers must remember that the packaging graphics are the first impression the consumer has of the product. It is imperative to make that impression a positive one. Here’s a company doing just that! 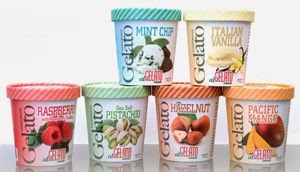 Al Gelato Inc., one of the original gelatorias in Chicagoland and long known for making gelato truffles, which are balls of gelato that are coated and rolled in a topping, has entered the packaged pint business. Just look at how these pints talk to the consumer. Though you cannot see product like you can in the many clear plastic gelato packages in the market, the bold graphics clearly illustrate what’s inside. Further, the “handmade” declaration and the reference to Chicago, personalize the product. Varieties are: Hazelnut, Italian Vanilla, Mint Chip, Pacific Mango, Raspberry with Raspberry Truffles and Sea Salt Pistachio. 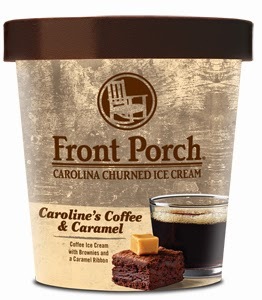 Front Porch Carolina Churned Ice Cream has added two flavors to its Southern-inspired ice cream lineup: Charleston Sea Salt Caramel and Caroline’s Coffee & Caramel. These two new flavors, along with the rest of the Front Porch family, are available in pints in select grocers’ freezers and scooped at the classic ice cream parlor located next to the original creamery in downtown Mooresville, N.C. Front Porch is handcrafted using local milk from a nearby dairy and loaded with premium goodies. The piece of caramel on the carton looks so real you want to reach out and pop it in your mouth! “These new additions fit perfectly with our other unique flavors and add to our story of Southern tradition in a way that people love,” says Michael Werran, production manager. 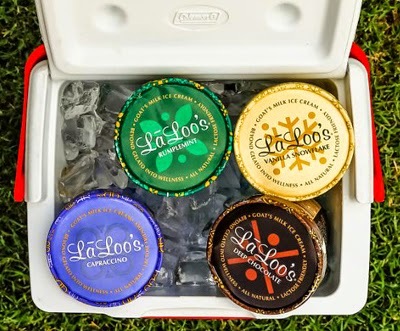 The flavors debuted at the 2014 U.S. Open. As the Official Ice Cream of Pinehurst (golf resort), these and other Front Porch flavors will be available at the Pinehurst Resort for the remainder of the year. Boston’s local ice cream churner “Batch” was named a Finalist for Outstanding Dessert in the Specialty Food Association’s 2014 sofi Award competition. The flavor receiving the accolades was Brown Sugar Bourbon & Pecan Ice Cream. A sofi is the top honor in the $88 billion U.S. specialty food industry. “sofi” stands for Specialty Outstanding Food Innovation and represents the best of the best from members of the Specialty Food Association. 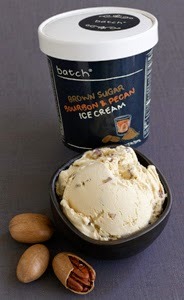 The Brown Sugar Bourbon & Pecan Ice Cream was one of 109 Finalists selected by a national panel of specialty food professionals from 2,724 entries across 32 awards categories. 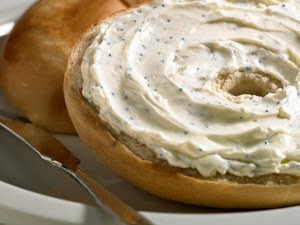 Winners will be announced at a red-carpet ceremony June 30, at the Summer Fancy Food Show in New York City. I’ll be cheering for you! Premium and personal can be found in private label. 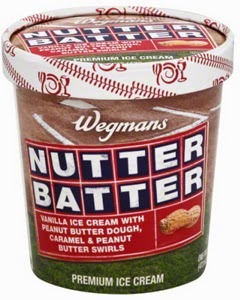 Regional supermarket extraordinaire Wegmans introduced two new superpremium ice cream flavors this season to appeal to American’s love for baseball and the great outdoors. Nutter Batter is vanilla ice cream with peanut butter cookie dough, caramel and peanut butter swirls. 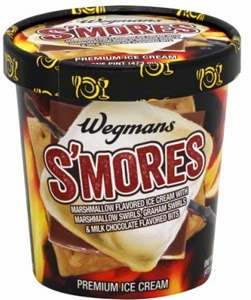 S'mores is marshmallow-flavored ice cream with marshmallow swirls, graham swirls and milk chocolate flavored bits. 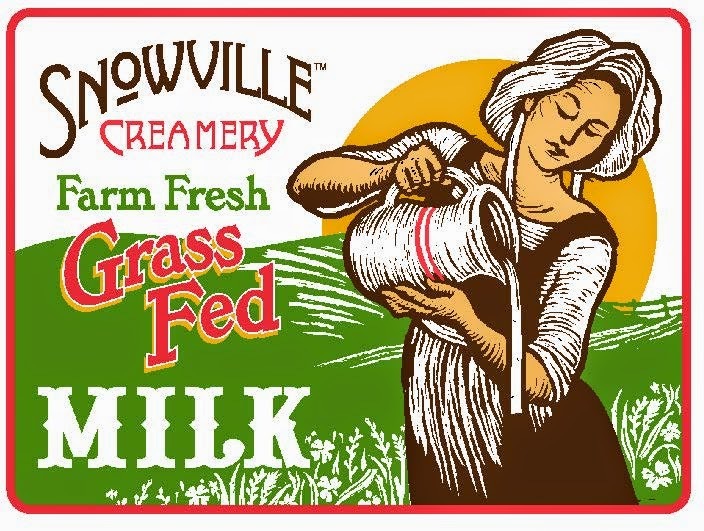 Both packages use whimsical graphics to illustrate the goodies inside….not the private-label design many of us remember from just a decade ago. 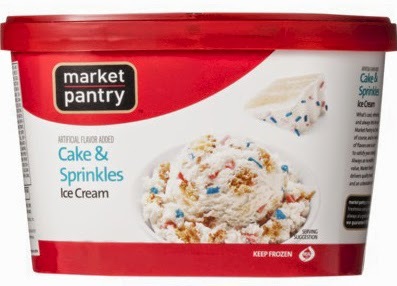 Look for more marketers using “free from” call-outs on ice cream packaging. For example, the Breyers brand now offer 36 gluten-free frozen dessert varieties. After going through a gluten-free validation process, these Breyers varieties feature a gluten-free logo consistent with FDA’s rule on gluten-free labeling. Unilever is doing this without changing the recipes. The Breyers varieties sporting the logo include family favorites such as Breyers Natural Vanilla, Chocolate, Strawberry, Mint Chocolate Chip, as well as certain Breyers Blasts! 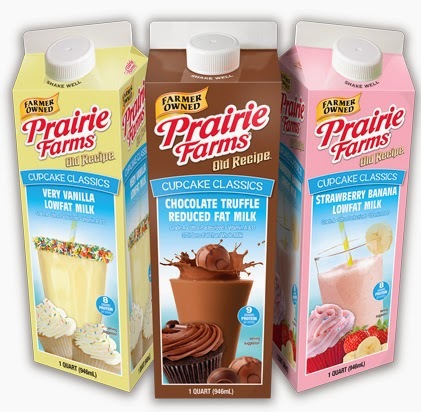 flavors, Cherry Vanilla, Butter Pecan and Fat-Free Chocolate and Strawberry. For the full list of Breyers gluten-free flavors, link HERE. 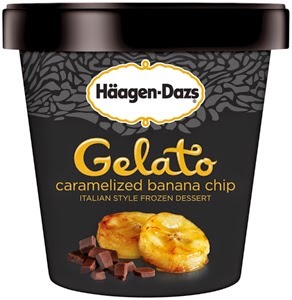 Expansions to the Häagen-Dazs Gelato line include: Caramelized Banana Chip, Pistachio, Pomegranate Swirl and Tiramisu. Tantalizing taste buds for only a short time, the Häagen-Dazs Limited Edition ice cream line expands to include: Banana Split Ice Cream (February - September), Midnight Cookies & Cream Ice Cream (February - December) and Pomegranate Dark Chocolate Ice Cream Bars (February - September). 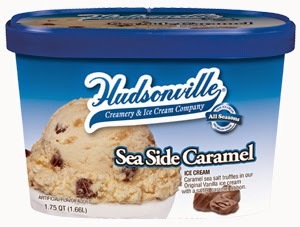 Taking a different approach to catching the consumer’s attention, Hudsonville Ice Cream recently introduced three new “All Season” flavors to its lineup of ice cream. 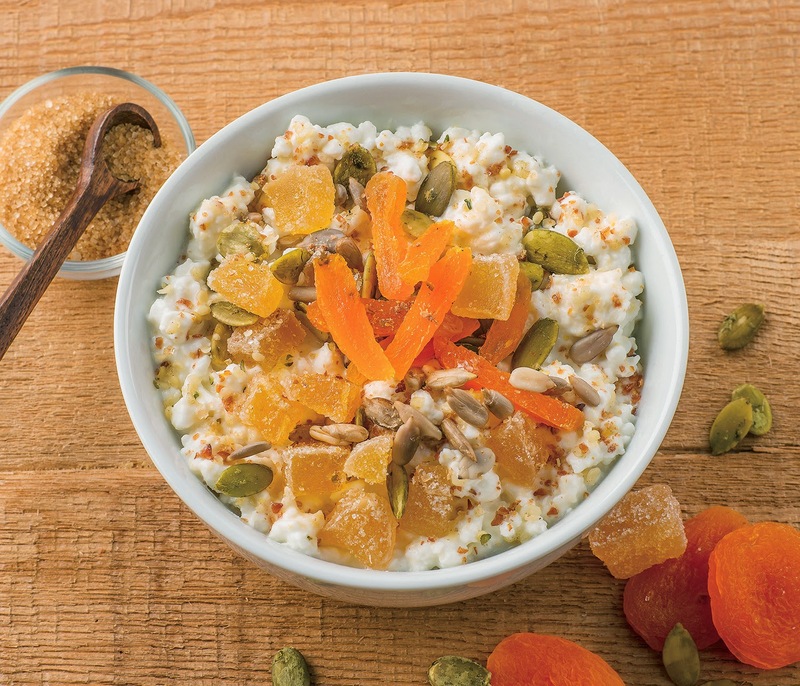 The All Season flavors are Hudsonville’s classic flavors that are available to enjoy all year long, while Limited Edition flavors change with the seasons around the Midwest and highlight the celebrations, freshest harvests and beautiful scenery of each changing season. 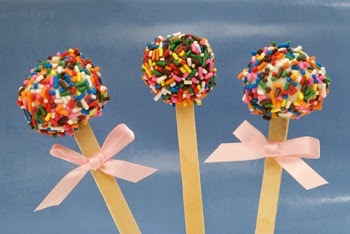 The new All Season offerings are: SeaSide Caramel, All Natural Vanilla Bean and Vanilla Chocolate Twist. Almost everyone loves ice cream, but not everyone can indulge in the richness. In response, creative marketers offer innovative options. This summer, LaLoo’s Goat’s Milk Ice Cream is using social media to encourage millions of ice cream fans across America to “Give Goat a Chance.” Compared to other top-selling cows milk ice creams, LaLoo’s Vanilla Snowflake has about half the calories, one-third the fat, is seven grams lower in sugar for folks watching their glycemic index and is easier to digest since goat milk is naturally lower in lactose and the fat particles are smaller in goat’s milk than in milk from cows. Other LaLoo’s flavors are: Deep Chocolate (rich dark chocolate ganache made with volcanic black cocoa and raw bittersweet cacao), Rumplemint (organic garden mint--not peppermint--with a bold excess of dark chocolate tiles, slow churned for extra creaminess) and Capraccino (coffee ice cream made from real Italian espresso beans). 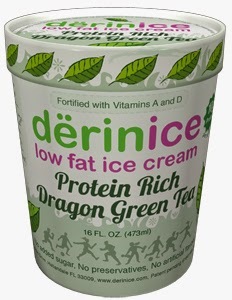 I really appreciate true innovation and that is what you get with Derinice Protein Rich Low Fat Ice Cream. 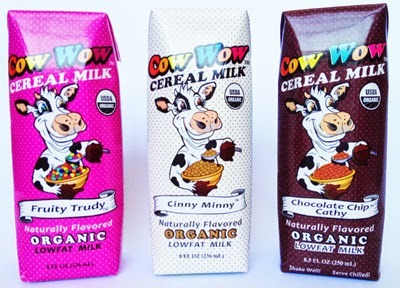 The product was just named the Winner of the 2014 World Dairy Innovation Award for Best Dairy Dessert. Without a doubt, this product deserves such high accolades. 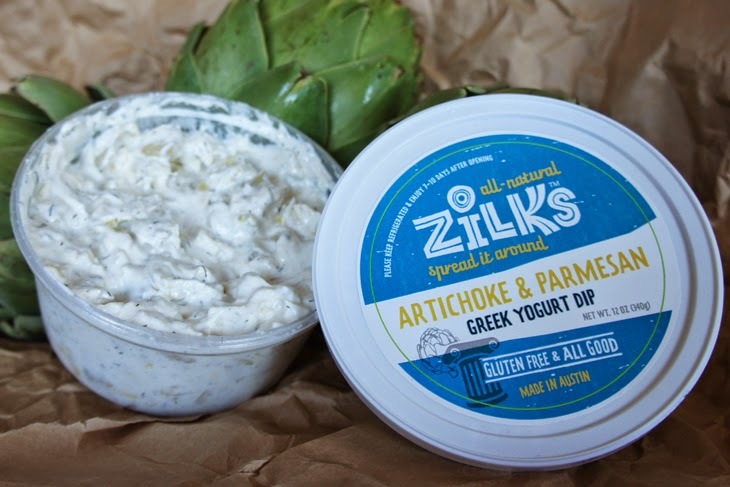 Stay tuned to see this product featured this Tuesday as a Daily Dose of Dairy. The Dannon Company recently expanded into the frozen aisle just in time for summer with the launch of Dannon Oikos Greek Frozen Yogurt. This new product offering, available in six flavors, marks the brand’s first move into the frozen-for-home consumption category. Available nationwide in pint containers, the six flavors are: Black Cherry, Café Latte, Chocolate, Key Lime, Strawberry and Vanilla. 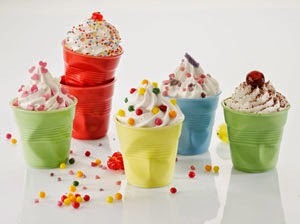 There are many truly innovative flavor concepts debuting this summer in foodservice, primarily as soft-serve. For example, in anticipation of summer vacations and the desire to experience other cultures through food, TCBY now offers globally-inspired flavors for the TCBY World of Fro-Yo, which kicked off on May 22. 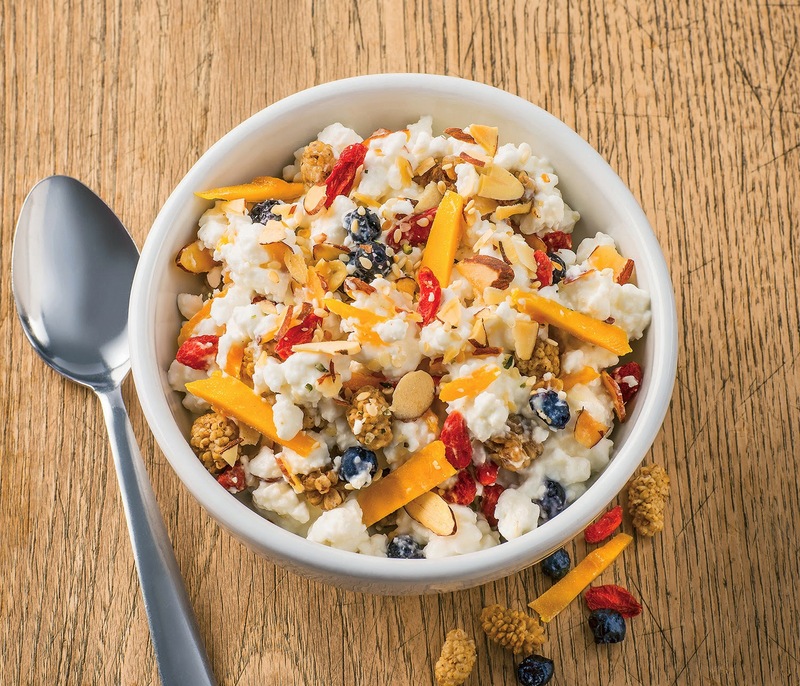 Created for culinary explorers and adventurous taste buds, the four featured flavors are offered in TCBY stores across the United States and take America’s hearts and palates on an international journey. Here are the four flavors and the limited time they will be offered. 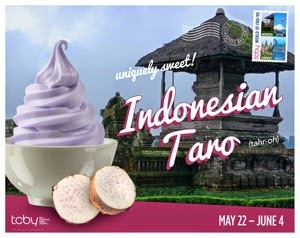 Indonesian Taro (May 22 - June 4) --like a relaxing day at the beach, the Taro offers a mellow and refreshing tropical flavor. 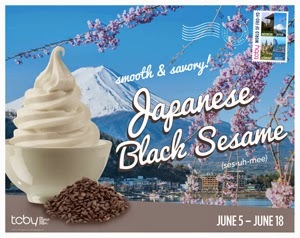 Japanese Black Sesame (June 5 - June 18) -- black sesame offers a sweet, toasted-nut flavor to classic vanilla. 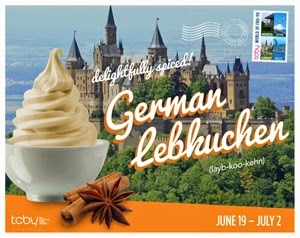 German Lebkuchen (June 19 - July 2) -- inspired by the famous German cookie, the Lebkuchen offers bold, warm spices and flavors of gingerbread and star anise. 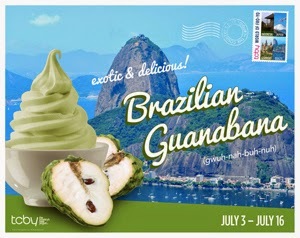 Brazilian Guanabana (July 3 - July 16) -- as fun to eat as it is to say, the guanabana is fruit that blends all the best flavors of pineapple, banana and papaya. Loosely inspired by the global soccer tournament, TCBY World of Fro-Yo will end the campaign with a Brazilian flavor during the global soccer finals. Stay tune! This is definitely an exciting World Cup with lots to talk about. 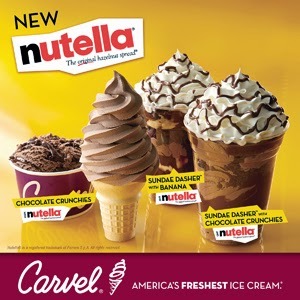 Carvel just launched a new line of treats with Ferrero’s Nutella hazelnut spread, which is made from the combination of roasted hazelnuts, skim milk and a hint of cocoa. It will be incorporated into four ice cream desserts served all summer at participating Carvel shoppes. The company is introducing the line this Monday, June 30, and it will be available until September 30. Guests can choose from Hand-Scooped Chocolate Ice Cream layered with Nutella hazelnut spread and Carvel Crunchies and topped with Nutella; Soft-Serve Ice Cream made with Nutella hazelnut spread; Sundae Dasher with Banana (layers of soft-serve made with Nutella hazelnut spread and Carvel Crunchies topped with whipped cream and Nutella); and Sundae Dasher with Chocolate Crunchies (layers of soft-serve made with Nutella hazelnut spread and bananas topped with whipped cream and Nutella). The final two products featured in today’s blog pays tribute to the upcoming Independence Day holiday in the United States. In honor, the Daily Dose of Dairy blog will not run next week, July 4th. 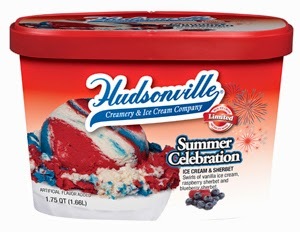 Three cheers for the Red, White & Blue, as Hudsonville Ice Cream introduces its latest Limited Edition seasonal flavor, just in time for National Ice Cream Month (July). Summer Celebration is an explosion of three flavors – swirls of creamy vanilla ice cream, raspberry sherbet and blueberry sherbet – blended in a patriotic color scheme that even Uncle Sam would be proud to savor. Down south we find another ice cream leader celebrating these patriotic colors. Red, White & Blue Bell from Blue Bell is a colorful dessert featuring a strawberry ice cream loaded with strawberries, a creamy vanilla ice cream and a smooth blueberry ice cream combined with real blueberries packaged side by side in one carton. 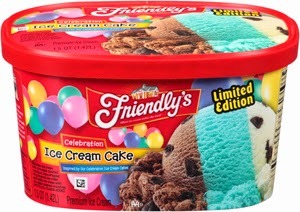 Not only is the side-by-side ice cream visually enticing, but the colorful carton is sure to grab the attention of shoppers as they make their way down the ice cream aisle. 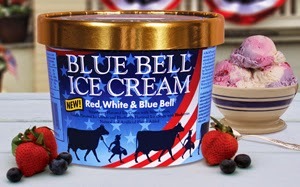 Each half-gallon and pint-sized container of Red, White & Blue Bell is adorned with eye-catching stars and stripes. To my U.S. subscribers (about 80% of the 6,000-plus), have a safe and happy holiday! And, if you are curious, here’s my IFT adventure. I arrived at the New Orleans airport early on Tuesday and was first on the wait list to get on a United 2:40pm flight to Chicago. I did not get on and needed to wait for my original 5:50pm flight, which after almost three hours of delays, was cancelled for mechanical reasons. The entire plane was IFTers returning home and we were told that there was nothing available on Wednesday…all three direct United flights to Chicago were overbooked. I was put on a 5:48am flight Thursday morning and given hotel vouchers for a dive airport hotel for two nights. On Wednesday night I received word that my Thursday morning flight was cancelled because of weather!!! While on the phone with United for more than an hour, eventually getting booked on another airline through Charlotte, I booked myself a 20-hour train ticket home. I eventually cancelled the train ticket and did get home thanks to the help of US Airways. Officials at IFT had already announced that the annual meeting would never be in New Orleans again because the expo is too large for the convention center. This is good, because I am not going back after my 48-hour effort to get home! During the past six weeks I’ve attended nearly back-to-back finished food product trade shows, with the last one—FMI Connect—wrapping up this past week. As a food scientist, the best trade show for me starts this weekend in New Orleans. It’s the IFT Annual Meeting + Food Expo. It’s where food product development begins, as ingredient suppliers showcase their technologies through innovative prototypes. 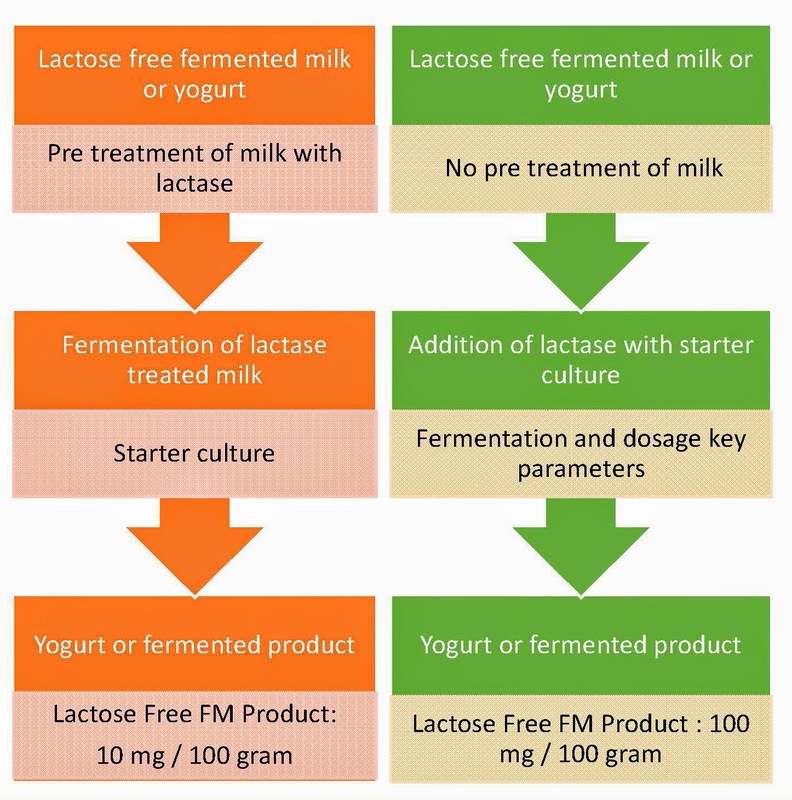 Ingredient technology trends from the show will be spotlighted in future Daily Dose of Dairy blogs. The Sweets & Snacks Expo was one of the many finished food shows I attended. 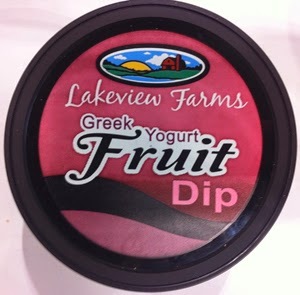 I often think of this one as an ingredient show, too, because so many of the sweets and snacks on display have potential as inclusions in dairy foods. 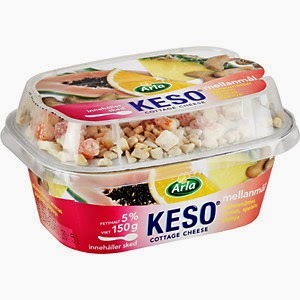 There are also interesting ingredient combinations that have application in dairy foods. 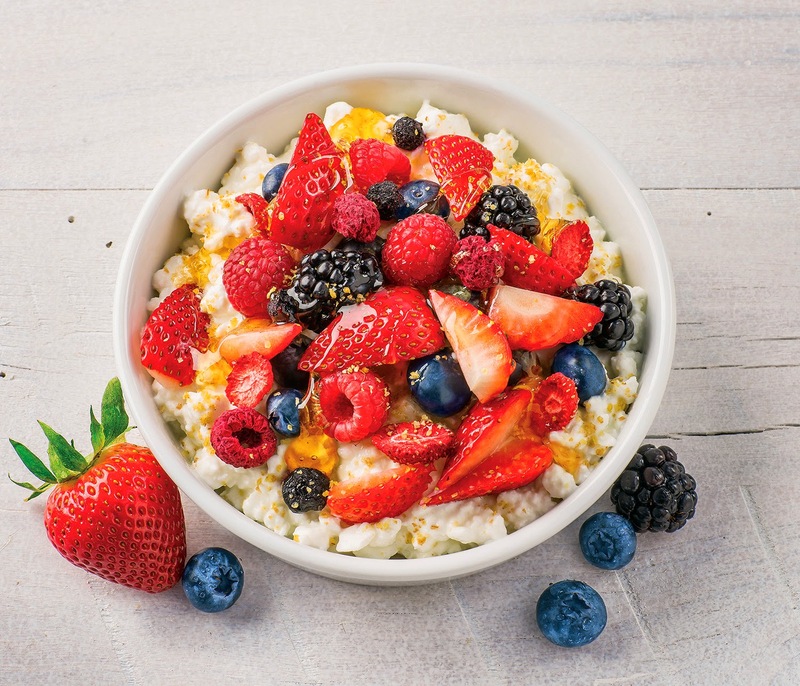 For example, as this year’s expo, broad food industry trends--including ancient grains, power foods, herbs and spices—were just as prevalent as a resurgence of classic favorites ranging from raisins to peanut butter to barbecue. All of these ingredient combos work in dairy. Mars showed the confections industry that old favorites do not need to be boring…Neither do vanilla and chocolate ice cream, or cottage cheese, cream cheese, etc. The company is rolling out new forms and sizes of many of its flagship brands. Mars Bites deliver big taste in small, bite-size pieces. This year, Mars adds three brands--Twix, 3 Musketeers and Milky Way Simply Caramel—to its popular Bites portfolio, joining Snickers and Milky Way. Convenient, unwrapped Bites give consumers the full-taste experience of their favorite candy bars in a smaller portion. 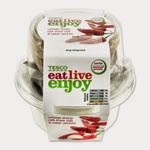 They’re easy to share and the resealable pouch makes it possible to eat some now and save some for later. This reminds me of Nestle Dibs ice cream. There’s room for similar concepts in the freezer case. Mars also showcased limited-edition M&M’S Brand Birthday Cake Chocolate Candies. This melt-in-your-mouth-not in-your-hand variety is milk chocolate infused with birthday cake flavor, one of the hottest flavor crazes on the market. Many ice cream manufacturers have jumped on this bandwagon, all with their own personal twist! How can you bring the celebration to your ice cream? 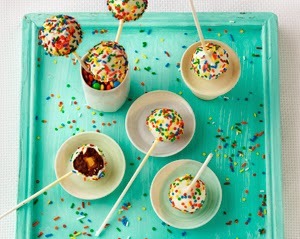 Think bite-size frozen or refrigerated truffles using ice cream, soft cheese and more. 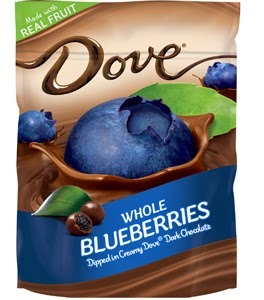 On a premium note, consumers can tantalize taste buds with Dove Whole Fruit Dipped In Dark Chocolate, a combination of real fruit dipped in silky smooth Dove Dark Chocolate. This decadent new item comes in blueberry, cherry and cranberry, three top-selling fruits. How can this concept be turned into a frozen dairy novelty? Not to be outdone by its rival, The Hershey Company unveiled its share of innovations. The company’s knowledge-driven approach and consumer insights to drive product development is evident in Ice Breakers Cool Blasts Chews. The new product is a first-of-its-kind mint and gum duo, providing an icy cool blast of freshness in a quickly dissolving chew. This makes me think of surprising flavors and exploding taste sensations in frozen dairy as well as kids’ dairy desserts, maybe even yogurt. Hershey’s Brookside Crunchy Clusters features clusters of crispy multigrain and soft fruit-flavored centers with sweetened cranberry bits, covered in smooth dark chocolate. 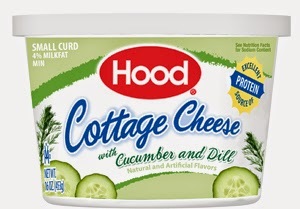 What a great mix-in for a dual compartment cottage cheese! The bakery specialists at Swiss Colony Retail Brands showcased Icee Cake Bites, which are both colorful and pumped with flavor. Three classic frozen drink flavors—blue raspberry, cherry and lemon--are available in the little desserts for the retail channel. Each layered cake reveals vibrant colors inside that match the flavor profile. Could such Icee flavors…or other popular candy and kids’ drink flavors…be turned into colorful sprinkles or edible glitter that adorns a hand-held ice cream treat? Think push-tube sherbet with brightly colored flavorful crystals or prills swirled throughout the different layers. The Jelly Belly Candy Company is embracing the craft beer movement with the launch of the world’s first beer-flavored jelly bean, Draft Beer Jelly Belly jelly beans. Hmm….combined with pretzel bits in a malt ice cream…salty caramel may have met its match! On the salty side of snacks, bold and exotic flavors were the name of the game. As taste palates and demographics continue to shift, food manufacturers are increasingly adding more flavorful and exotic herbs and spices to a variety of products, including dairy foods. Last year’s unexpected Sriracha shortage seems not to have had a lasting impact as food manufacturers continue to experiment with the red chili and garlic condiment. Similarly, Tabasco is popping up in a variety of products, often paired with chocolate. If the two can be teamed up together in a candy bar, why not in a flavorful inclusion intended for ice cream or even cottage cheese? Other herbs and spices featured at the show included ginger, rosemary, wasabi, sage, sea salt and cracked pepper. All can become flavors of colorful fabricated inclusions. 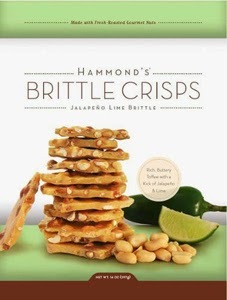 Hammond’s Candies showed attendees that bold and adventurous is not limited to chips and crackers. The company added seven flavors to its Brittle Crisps line, giving the classic treat a fresh new edge. The new flavors include buttery Maple Walnut, imaginative Jalapeno & Lime Peanut Brittle, a sublime Sea Salt Caramel Drizzle Peanut Brittle and for the adventurous, truly spicy Cayenne and Cashew brittle. 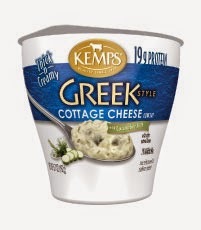 I brought a few samples home and tried them in ice cream and cottage cheese. They were unbelievably delicious! A number of interesting gum products were unveiled at the show. Mondelez International transformed its popular Sour Patch super sour gummy candy line into a sugar-free kids gum line under the Stride brand. Concord Confections Inc., puts some sparkle in the chew with Fizzers, a line of fizzing bubble gum. Vidal Candies makes gum sporty with gumballs designed to look like soccer balls and baseballs. 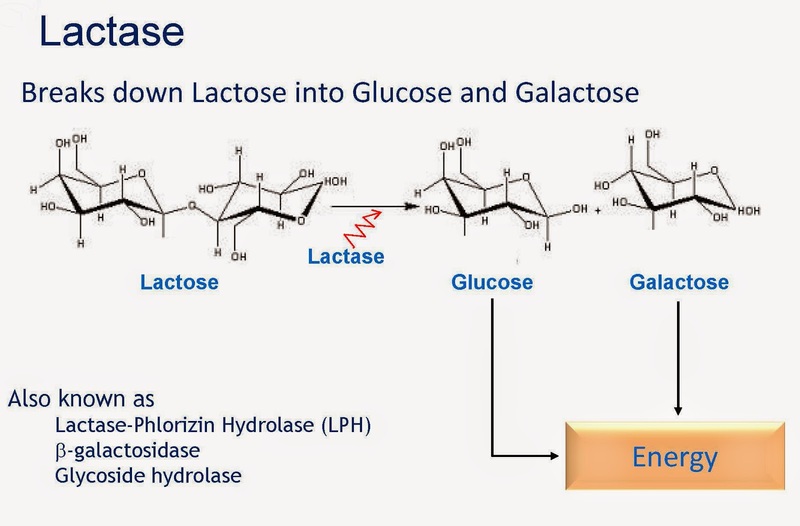 So, if you are one of the fortunate to attend IFT this coming week…I know, New Orleans in June sounds so appealing…keep your eyes open for innovative inclusions that can put the “wow” back into your dairy foods. Talk with the suppliers. See how they can customize their bits and pieces to be your signature extra. Here are some new products in the market that recently caught my eye. 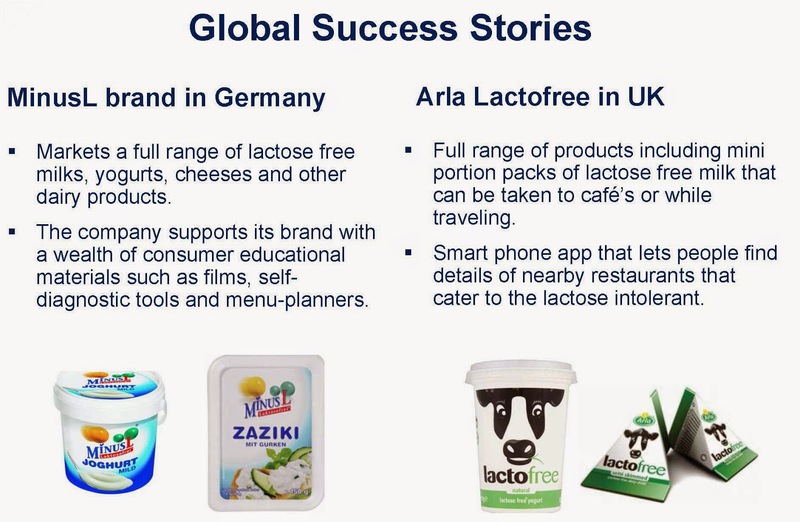 Note how these companies use inclusions to make their products stand out from the competition. I don’t think I will ever recover from Ben & Jerry’s take a few years back on the Saturday Night Live (SNL) Schweddy Balls episode. The ice cream flavor featured Fair Trade vanilla ice cream with a hint of rum and was loaded with fudge-covered rum balls and milk chocolate malt balls. Ben & Jerry’s is celebrating SNL humor once again with two new flavors. This time for scoop shops only. New Lazy Sunday is inspired by a rap song about the famous cupcakes from Magnolia Bakery. The ice cream takes the song’s culinary cues with vanilla cake batter-flavored ice cream, yellow and chocolate cupcake pieces and a swirl of chocolate frosting. Then there’s Gilly's Catastrophic Crunch, which is based on Kristen Wiig’s frantic, mischievous little girl character. The new flavor combines chocolate and sweet cream ice creams, with caramel clusters, fudge covered almonds and a marshmallow swirl. Not SNL related, but just as new is Turtle Cheesecake. As the name suggests, it is cheesecake ice cream with pecans, fudge flakes and a caramel swirl. There’s a lot to learn from the bakery category and a great deal can be translated to dairy, predominantly frozen desserts. 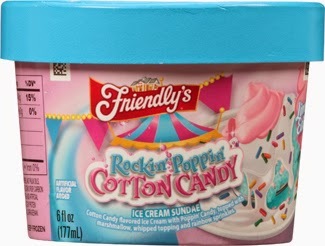 Friendly’s is showing us that the packaged sundae is much like the freshly scooped gelato, just with all the bits, pieces, candies and more that we love in ice cream. 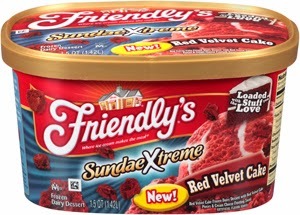 The company recently introduced Red Velvet (red velvet frozen dairy dessert with red velvet cake pieces and cream cheese frosting swirl) and Nutty Caramel (vanilla frozen dairy dessert with sugar cone pieces covered with chocolate-flavored coating, chocolate-covered peanuts and caramel swirl) under its SundaeXtreme sub-brand. 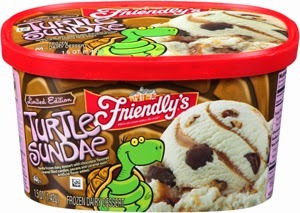 Limited-edition sundae flavors include Turtle Sundae, which is vanilla frozen dairy dessert with chocolate-flavored caramel-filled candies, pecans and caramel swirl. 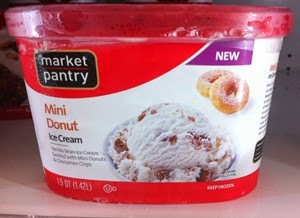 Doughnuts are the new cupcake and Target Corp., is right on track with its new Mini Doughnut Ice Cream sold under the private-label Market Pantry brand. 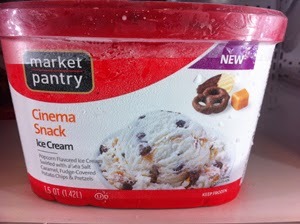 Other recent innovations from Target include Cinema Snack, which is popcorn-flavored ice cream swirled with sea salt caramel, fudge-covered potato chips and pretzels. It’s the big screen in a bowl. There’s also Cake & Sprinkles, which is just what the name suggests. 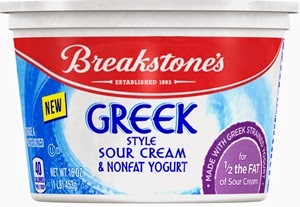 Wells Enterprises, manufacturers of Yoplait frozen yogurt products, introduces Greek with Granola in blueberry and strawberry varieties. The product resembles a frozen “breakfast” yogurt novelty product that the company had offered a few years back under its Blue Bunny brand. 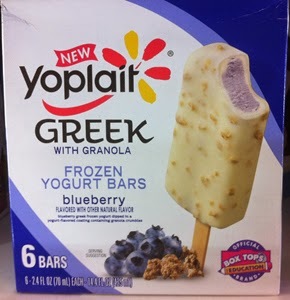 The new Yoplait item is a frozen fruit-flavored yogurt center dipped in a yogurt-flavored coating containing granola clusters. One of the greatest opportunities for dairy processors in the U.S. is the under-developed category of refrigerated dairy desserts. 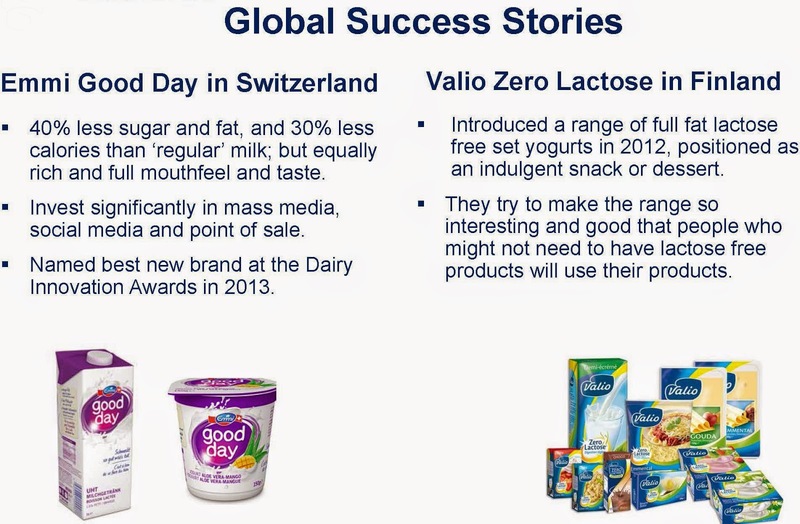 (Sneak peek: Monday’s Daily Dose of Dairy will spotlight a new dessert concept from Dannon.) Inclusions play an important role in these convenient, premium refrigerated treats. 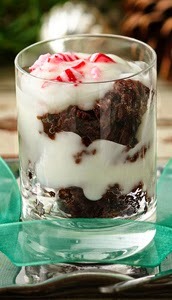 Single-serve layered treats packaged in clear containers can convey all the goodies inside. The package is key to the concept. And here’s the last goodie to share before I must start packing for IFT. Dean Foods is extending its popular TruMoo milk brand to the freezer. This is just a sneak peak. 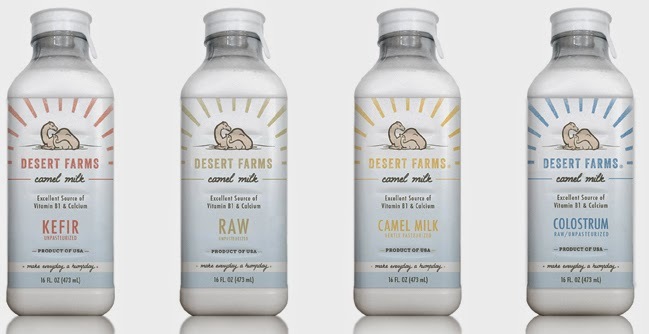 The product line will be featured this Tuesday as a Daily Dose of Dairy. 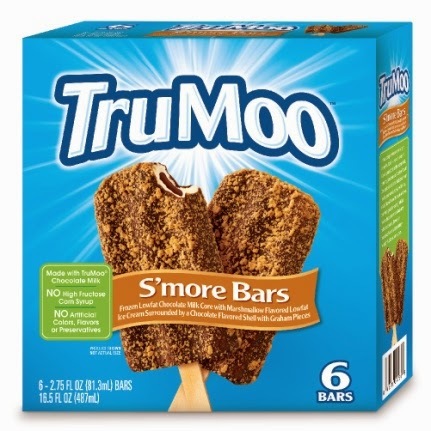 Here you see TruMoo S’more Bars, which is a frozen low-fat chocolate milk core with marshmallow-flavored low-fat ice cream surrounded by a chocolate-flavored shell with graham pieces. The product is really made with TruMoo Chocolate Milk!